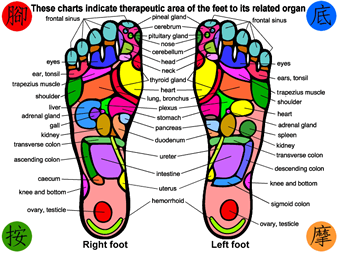 What is Foot Reflexology ? Massage has been used as a healing therapy for thousands of years. Historical texts from ancient cultures show that they considered massage to be calming, soothing and relaxing, and also very important as a healing therapy. With the recent revival of interest in alternative therapies, massage has once again attained an important place as a holistic cure and preventive therapy for various ailments. There are many different kinds of massage therapies available, each of which offers specific benefits to the mind and body. 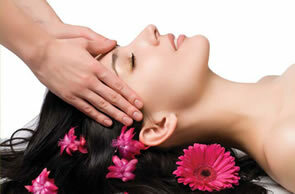 Body massage therapies are mainly derived from two schools. The modern Western school of massage therapy aims at releasing muscular tension and joint stiffness by facilitating the circulation of blood and the lymphatic system. The Oriental school of massage therapy releases blockages and improves the flow of vital energy in the energy channels that course through the body. Hot Stone Massage is a style of massage therapy in which water-treated stones are placed at specific sites on the client's body to promote relaxation and to help open up the merdians (energy pathways). Muscles are pretreated with the heated stones to allow the therapist to more easily perform deep tissue manipulations. Cool stones are sometimes used alternately with hot stones. Massage oils are usually incorporated into the massage treatment. A hot wax bath or hot wax therapy involves using a specially heated container of plain wax designed for the purpose. It is a treatment that can soothe the skin and calm the soul; it can also lighten up burdens of your hand and feet. It may even bring you further into the world of good health; physically, mentally, and emotionally.It is very good remedy if you feel joints pain and good to beautify those rough and dry hands and feet. In hot wax body therapy a vessel with wax that automatically melts as you turn it on. Then it will keep wax at its safe temperature for sensitive skin. At Zen Heart Massage, we work hard to make massage therapy available to everyone. That's why we provide therapeutic massages as late as 9pm, 7 days a week. 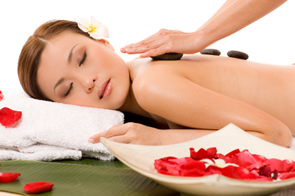 Our massage services range from Foot Massage, Body Massage, Hot Stone Massage and much more. And we keep our massages affordable so you can use more of our services when you visit us! Need more convincing? Give us a call at (858) 592-8880 to get started with your first massage and feel for yourself. © 2011 Zen Heart Massage . All Rights Reserved. Designed by Weblance Development, Inc.